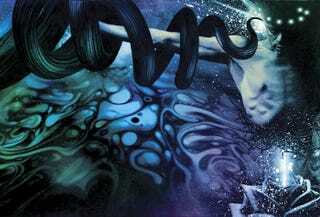 I've found myself admiring John Picacio's art a bunch of times without knowing his name. His images have appeared on the cover of a bunch of books from Pyr, Tachyon and several other publishers, including this wrap-around cover illustration for Son Of Man by Robert Silverberg. His work has a grand kinetic sweep that helps put the "opera" in "space opera." There's a gallery of some of his covers, including his newly completed cover for Dan Simmon's Muse Of Fire, below. I’ve never thought about my work with any driving philosophy behind it, really. I just react to the things I see in my head, our chaotic world that seems to be more chaotic every day, and to the genre manuscripts that I’m fortunate to illustrate on a daily basis. But hopefully my images connect on their own without me! His cover illustrations for The Margarets by Sheri S. Tepper and Time's Child by Rebecca Ore were both named as finalists for the Chesley Awards recently. His website is here and you can keep up with his work on his blog.